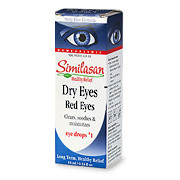 Similasan Eye Drops provide Healthy Relief with no known side effects or drug interactions. For adults and children age 2 and over: Remove tamper-evident seal from neck of bottle. Twist cap off bottle. Apply as needed. Replace cap after use. Warnings: For external use only. Initial exacerbation of symptons may occur. Replace cap tightly after every use. To avoid contamination, do not touch the tip of the container to any surface. Discard open bottle after 30 days. Contact wearers: consult a physician prior to using. Active Ingredients: Mercurius sublimatus 6x, Belladona 6x, Euphrasia 6x. Eye Drops #1 Red Eyes is shipped in a discrete, unmarked package. Orders are processed immediately and usually take about 3 to 5 working days to be received. We do ask that you try it for 2 to 3 weeks to feel the full effects. Any information received is used only for order processing and shipping purposes. Your information, such as e-mail address, will never be disclosed to a third party.